Waterworld: A Live Sea War Spectacular, also known as Waterworld, is an attraction based on the 1995 film Waterworld found at Universal Studios Hollywood (1995), Universal Studios Japan (2001), and Universal Studios Singapore (2010). The original attraction opened at the same time as the film. Although the film was considered a critical and financial disappointment, the show was highly praised, winning a 1996 Thea Award from the Themed Entertainment Association. The attraction remains highly rated by park guests. Adapted by Ben Hurst, the attraction's story occurs after the events of the movie, beginning with Helen's return from "Dryland" to get her friends from the "Atoll". The show includes the characters Helen, the Deacon, and the Mariner, as well as several "Atollers" and "Smokers". The show is 16 minutes long and includes stunts on water, land, and overhead, supported by many pyrotechnic, flame, water, and other special effects, including the explosive crash landing of the seaplane. The stunt show's unique soundtrack was crafted from snips from the movie score. The seating is in three sections of arena seating. The first five row of seats are the "Soak Zones", which are the target of splashes from the Jet Skis and various wet special effects. The show begins with the Atollers noticing that Helen is returning and they signal back and open the gate to let her in the atoll. She informs them of her discovery of Dryland and that the Smokers are after her. The seaplane attacks the atoll while two of the Smokers break in. One of the Smokers opens the gate to let the other Smokers inside. Helen and the others fight them using water cannons but the Atollers are one by one killed while Helen jumps from the tower that she's standing on before it collapses. One Smoker signals the Deacon, who immediately arrives and takes Helen hostage, demanding that she tell him the whereabouts of Dryland and has one of the surviving Atollers dropped into a toxic tank when she refuses. A Smoker realizes that the Mariner is coming, who emerges from underwater to get into the atoll, leading to a massive brawl between Helen, the Mariner, and the Smokers (in which a nearby fuel tank leaks after being shot at by the Deacon) that ends with all the Smokers being killed, with the Mariner seemingly killed as well. The Deacon proceeds to escape with Helen, but the Mariner, who survived, rescues her and resumes the fight against the Deacon. During the fight, the Deacon accidentally shoots down the seaplane, which crashes into the atoll. In the end, Helen sets the Deacon on fire, causing him to fall into the water, killing him. This lights the leaking fuel in the water. Helen and the Mariner manage to escape on Helen's boat before the fuel tank explodes. ^ Wharton, David (October 12, 1995). "Wet, Wild Saga Continues for 'Waterworld'. Universal Studios to Unveil Stunt Show Based on the Film". "Los Angeles Times". Los Angeles. Retrieved January 9, 2010. ^ "Waterworld". Inside Universal. Archived from the original on October 7, 2007. Retrieved January 9, 2010. 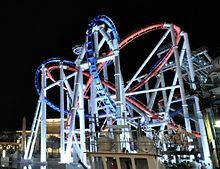 ^ "Universal Studios Hollywood's 'Waterworld – A Live Sea War Spectacular' Brings Blockbuster Movie Surging to Life" (Press release). Universal Studios. June 14, 2007. Retrieved January 9, 2010. ^ "WaterWorld: A Live Sea Spectacular". theStudioTour.com. 2006. Retrieved January 9, 2009. "Action Horizons (Waterworld stunts)". Action Horizons. Retrieved January 12, 2010. "AET Company Profile". Advanced Entertainment Technologies. Retrieved January 9, 2010. "Amphibian Stunts: Exciting, Safe and Reliable Live Shows (Waterworld Singapore & Hollywood refurbishment 2013)". Amphibian Stunts. Retrieved January 9, 2010. 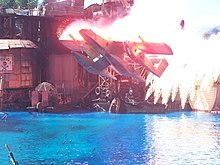 "Flame Effects (Waterworld Japan)". The Attraction Services Company. 2007. Retrieved January 9, 2010. "News". Birket Engineering. Retrieved January 9, 2010. "Waterworld (Japan)". Grayson Production Services. Retrieved January 9, 2010. "Norm Kahn". Utopia Entertainment. Archived from the original on February 1, 2009. Retrieved January 9, 2010.